Whistler has utilized its high performance antenna design and incorporated it into a totally new remote installed Laser/Radar detector! This model not only packs features common with Whistlers high end models such as Ka Max Mode, RSID, LSID, 4 Filter modes and Real Voice but it was designed up front to be expandable for future accessories. The Whistler Pro-3600 maintains the easy to install nature of previous remote units and many of their unique features, such as: Multi-Directional Text Display, Compact Display Module, Outside Temperature, Battery Voltmeter and Flexible Mounting options. New features include its modular design for expandability and an Alert LED that can double as a faux auto security alarm indicator. 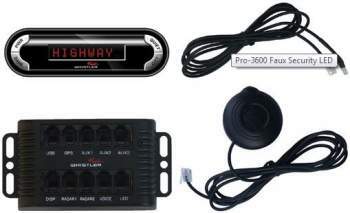 The optional GPS module (model number: RLC-360) provides you with unique features not found on units without GPS such as: Compass Headings, Clock, Vehicle Speed, Max Speed, Trip Time and Miles, known Red Light/Speed Camera Locations, Automatic Auto Quiet and Filter Modes with Speed, Adjustable Over Speed Warning and more. MODULAR DESIGN - modules can be added to enhance the unit's functionality such as GPS, Rear Laser-Radar Antenna, Laser Modules, etc. Size: (Display) = .95" x 3.22" x .58"
Size: (Radar) = 1.74" x 3.54" x .90"
Size: (Interface Box) = 2.36" x 4.40" x .9"
Size: (Voice Module) = 2.19" x 1.21"